Two very bizarre cases of alleged killer and phantom clowns, one from 1854, and the other, a modern report from 2016, have come my way. 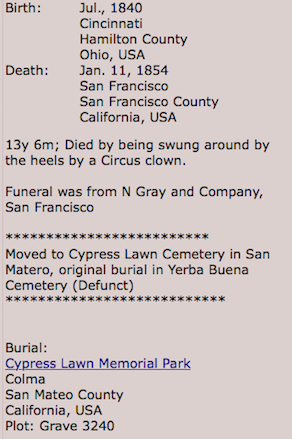 A young boy, 13 years, 6 months old, named William Snyder was allegedly killed on or before January 11, 1854, by "being swung around by the heels by a circus clown." This occurred in San Francisco, California. Snyder was born in July 1840, in Cincinnati, Ohio. The data on this killing are to be found at the Find A Grave site, and through Vital Records, reproduced here. Meanwhile, on May 4, 2016, the newspaper, A.D. Haagsche Courant, where the well-known Fortean journalist Theo Paijmans works as a reporter, published his first Phantom Clown report. 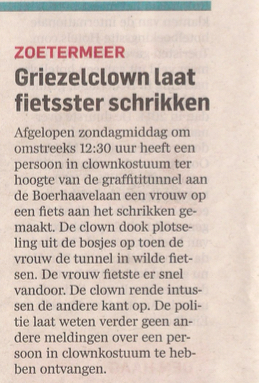 Last Sunday afternoon at about 12:30 hours a person in a clown costume frightened a woman on a bicycle in the vicinity of the grafittitunnel at the Boerhavelaan. The clown suddenly emerged from the underbrush when the woman was entering the tunnel. The woman quickly sped away. The clown ran off in the opposite direction. Police state that it has received no other reports of a person in a clown costume. 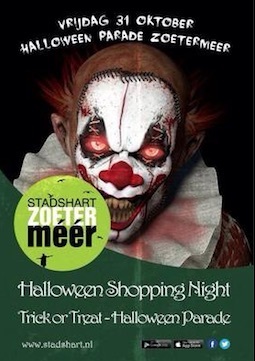 Zoetermeer experienced a clown scare flap in 2014, because of posters of evil clowns that were distributed in connection with Halloween. Children became frightened and mothers and shopkeepers protested because the poster was too frightening. 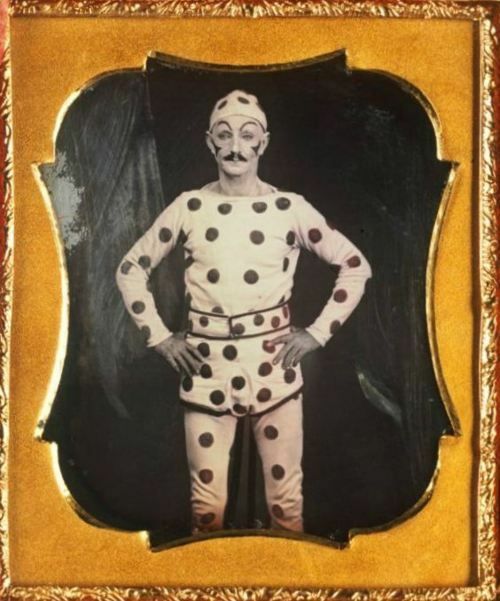 At top, a 1850-55 daguerreotype of a clown is posted for illustrative purposes only. For more on "Killer Clowns" at Twilight Language, click here. My thanks to Tim Cridland for bringing this 1854 record to my attention. And to Theo Paijmans for his Netherlands reporting. If the boy was thirteen and a half years old, and the clown swung him by his heels, that was a very strong clown. White House Shooting: Suicide-By-Cop Attempt? What Is Coming From Space on June 3rd?